With the suggestive title "Brain power at the service of leadership and happiness in life and in business " the first day of Neuroscience to be held on 26 November at the Etseib (ETSEIB) is presented. My participation will be a spectator, but the day promises to be interesting and entertaining. We learn how to motivate people working in our environment and how companies get happier. The teacher Silvia DamianoExpert of the human brain and professor at Mt. Eliza Executive Education at Melbourne Business School, will explain his latest research on commitment and leadership in women and men. As reflected in his latest book, Engage Me (Involve me), companies with more committed people generate more revenue, profit and earnings per share. Those most involved perform their work better and 20% are reduced by 87% initiatives leave the company (loyalty, performance). The companies involved are 43% more productive. What is the "engagement"? "You put your head and your heart in what you do and love him," said Silvia Damiano. The three E (in English) of involvement are "Enjoyment" (Enjoy), "Emotional connection" (emotional connection), "Empowerment" (Liability). Neurally Silvia explains these concepts from the notion of "flow" (flow). I wonder if it's the same concept of "flow" that applies to video games and applications: the state that you get (depending on your abilities and task difficulty) in which time flies and which completely disconnected from what's around you. For his part, Professor Albert Figueras of the Autonomous University of Barcelona, ​​physician and pharmacologist who studies the neurological basis of welfare, explain how the oxytocin, a hormone present in childbirth and lactation, is essential in establishing good social relations. Also influences our commitment, our decisions, how to work together and how we relate to our organizations. The day will end with a round table moderated by Professor of ESADE Margaret MartinWhere different experts and business leaders explain its strategies to improve engagement, loyalty and help working people to be happier. 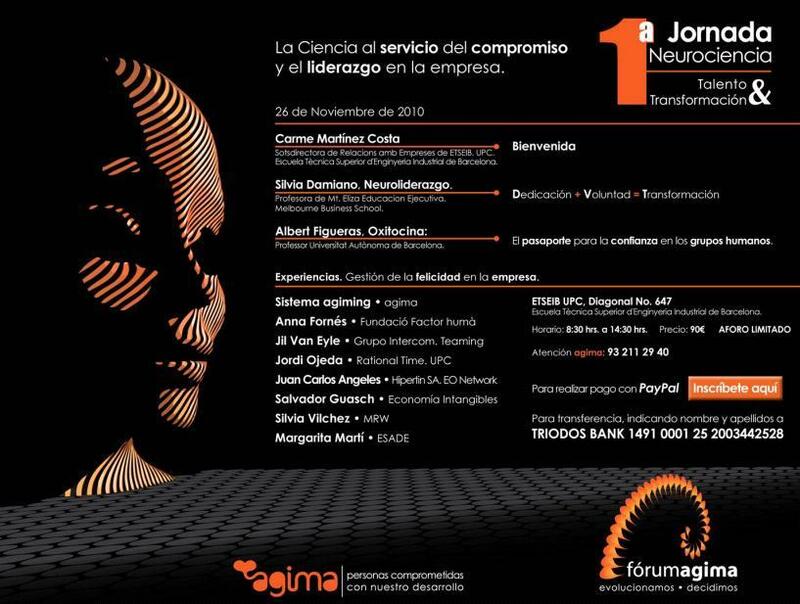 Among the speakers will be: Love Agima Pujol, Anna Fornes humà the Factor Foundation, Jil Van Eyle Teaming Intercom Group, Jordi Ojeda Rational Time and UPC, Juan Carlos Angeles Hipertin SA. EO Network Economies Salvador Guasch Intangibles and Silvia of Vilchez, Director General of People of MRW. In the attached image I have included the program of the day. From 24 to 26 September is celebrated in Alicante Internet Mediterranean CongressIn which I have the pleasure to participate with distinguished speakers such as Enrique Dans, and Eduardo Manchon Eneko Knörr. 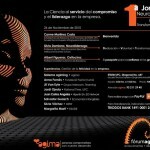 The ICT Sector Business Association of Valencia (ESTIC) and the IFA exhibition center (IFA) promote this congress about the many aspects of the Internet. Under the generic name Internet Mediterranean CongressThis event will bring together all weekend in Alicante to some of the most renowned experts and companies, nationally and internationally, are leading the revolution of the digital economy. For my part, I participate making a Taller de Benchmarking, Which will explain to participants how to make a good analysis of competition online, how to detect what actions Digital Marketing is performing, how to know which target attacks, and what parameters measured to determine their position and ours. All with the ultimate goal of being able to make a good action plan online. For more information about the conference you will find it on their website: Internet Mediterranean Congress. Wednesday at 7 pm will be held at the Cultural Hall of the English Court of Sabadell, the Search Engine Optimization Course which it is part of the lecture series on Digital Marketing that we are giving in this mall. In this class we explain the keys to appear in the top positions in searches performed on Google and other search engines. We explain both how it should be built website to be indexed optimally, as once you have the page indexed, what should we do to improve our position. We discuss in depth the concepts of density, prominence, reliability, PageRank algorithm and many others related to the improvement of SEO issues. Also we explain what tools are at our disposal in both internet to track our position as to improve it. Attendance is free but seating is limited.